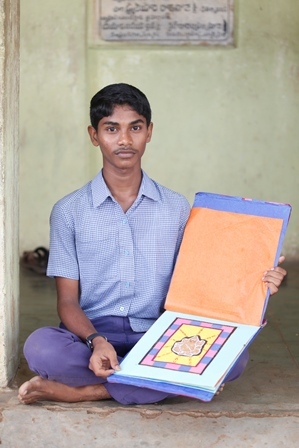 This boy displaying his creative art is Bhanuprasad, studying in Standard IX at the Zilla Parishad High School, Aganampudi, Vizag. He is the leader for National Green Corps (NGC) a group formed by the school to encourage students to eat the mid-day meal and create awareness on the nutritional values of it. Bhanuprasad is a very smart student and aims to join the armed forces to serve the nation. He is a topper in his class and sets an example to all his classmates. He is an all-rounder, extremely talented in painting, art and craft. Bhanu's enthusiasm for learning is immense as is evident from his narration about his passion for studies. "I always read the lessons before they are taught in class. That way, I understand better and clear my doubts if any. My parents are very confident that I will study well and get a good job to settle comfortably in life unlike our present condition." Bhanu's father does small welding jobs and mother is a homemaker. Brother Jagan, who also studied in the same school and was a beneficiary of the Akshaya Patra mid-day meal is now pursuing his Diploma and wants to be an Engineer. With little income, Bhanu's mother tries hard to manage the family of four with basic necessities. Bhanu says, "My mother feels very happy since I get to eat healthy food for lunch and that she need not worry about packing food for me." He likes the vegetable biriyani served as part of the mid-day meal and ensures that all his friends eat their meal every day.